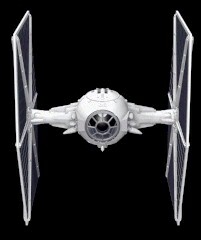 A reconnaissance version of TIE fighter, constructed by Sienar Fleet Systems (SFS) for the Galactic Empire and private contractors. The scout fighter sports only one laser cannon, but uses the extra space to carry enhanced sensors that are more powerful compared to baseline TIE/ln starfighter. In campaign play, the TIE Vanguard flight should detect enemies and scout systems as if it were a capital ship, not a fighter flight.